insert your blog name into the url above and you are good to go. Found a new way to annotate blocks and facilitate output to databases. Use the visibility parameters on dynamic blocks. This lets you set what is visible vs invisible on the block for whatever parameter you have currently chosen. Use this to display hydrologic group or land use rating (fair,good,poor) for instance. This data can then be extracted, then copied and paste it to the spreadsheet exported map3d attributes (put an attribute in the object data that will be blank upon export, then copy with the land uses). You can add pull down menu choices to excel. Go to the data validation pull down shown highlighted above. Choose list from the allow drop down box. Choose the cells you want as your choices for the source (D1:D3 in the example give 1,2,3). You can use topology overlays to create new topologies (intersections of, unions) based on properties shared between the two. Using this new topologies, you can do GIS analysis CN analysis for hydrologic groups and land use. Data from the topology overlay analysis can be used for an overall CN calc, etc. Topologies are prepared for each category -- watersheds, hydrologic groups, and land use. The watersheds are delineated in Civil 3D. The hydrologic groups topology is made by importing NRCS SHP files for soils. The hydrlogic groups is assigned by a variety of methods. The most simple way is to just enter the group in the object data via the properties toolbar for each polygon. The land use topology is fashioned the same way as the other three. This topology will also have the uses assigned via the properties toolbar. A visibility dynamic block can help with importing features with a pull down menu. This data is exported with the "dataextraction" command and can be copied and pasted to the shape file of a dbf database. The topologies are then overlayed. 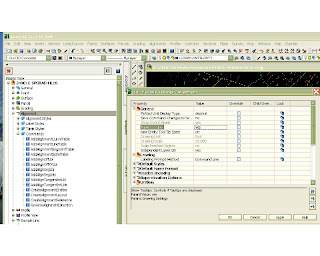 An object data table is created for each subsequent topology for assigned data from the relevant topogies. It helps to have seperate layer assignments for your topology linework, centroids, and annotations. Use mapwspace to turn on task pane for GIS layer controls. Change the resolution display of curves with viewres command. Recently, I’ve had trouble deleting annotative text. I’d select it and delete it, to no avail whatsoever. Talked to a co-worker and discovered a workaround – you have to do the audit command, then select no. For some reason or another, this is necessary make the text deletable. Create alignment entities on C-ALGN. Don’t freeze or turn off the object layer – FREEZE (not turn off) C-ALGN, and no lines or curves from alignment will show. You have to have the alignment on in order for the labels to show. By freezing the entity layer, the alignment is still considered “on”. Via right click on the entity (grading, alignment, surface) category under the tool prospector. Adjust under tool tip display setting (yes/no). But NOT the layer that the alignment is on (C-ALGN-****). Have the labels on a layer separate from the alignment entities (arrows, etc) and put on C-ALGN-TEXT. Create an arc based feature line using desired elevations. Explode the feature line for a tessellated 3d polyline. Weed the polyline to get rid of undesired excess vertices. Use express tools flatten command to convert to 2d polyline. Hide contours by using surface boundaries (hide/create breakline). Turn off the tooltips listed next to your cursor by adjusting the settings under alignment, surface, etc. as shown.